Say it ain’t so. The crooked, weather-beaten summit sign on Kilimanjaro will no longer greet climbers as they cross the mountain’s summit ridge and climb the mountain’s highest point. Now a shiny new sign stands at attention on Uhuru Peak waiting to congratulate a new generation of climbers. Anyone who has climbed Kilimanjaro knows that the old sign was more than a place marker; it was a symbol of accomplishment providing climbers with the last push they needed to make it all the way to the top. The new sign will surely fill the important role of the old one, and we can only hope that before long it will be just as weather-beaten and crooked. I can’t help but wonder about what happened to the old one. I’m sure there is a good story there. 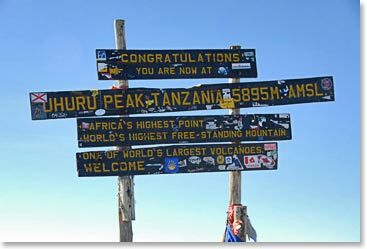 Be one of the first to get a summit shot with the new sign and join us on Kilimanjaro this summer! 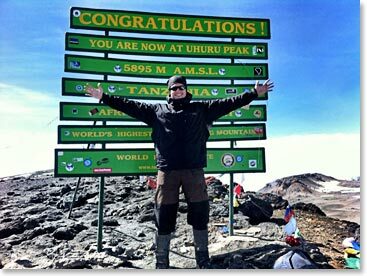 This entry was posted on Monday, March 5th, 2012 at 2:56 pm	and is filed under Kilimanjaro.